To Love a Rose: Happy Happy Time! 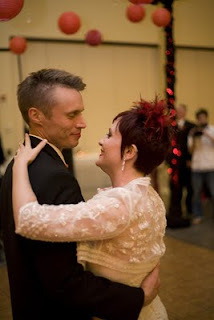 Since we're going to be leaving in a couple of days, I thought I'd go ahead and blog about this...our anniversary! Sunday will officially be one year. One small year. One small, full, lovely, wonderful, perfect year of wedded bliss! This is an important milestone in our marriage; but it's also important, because it makes us officially eligible to adopt from Ethiopia (one year of marriage is the minimum)! So, super exciting! I am so blessed to have had this man in my life for over 3 years! I know what my life was like before him, and I would never want to go back to a world without him! When I called out for God to answer my prayers for a soul-mate and best friend, he answered them ten-fold! I have the perfect person for me in my life until the day we die; what more could I ask for? He's so wonderful and kind and selfless with me and just about everyone he meets, I know he's going to be such a fantastic father one day soon! 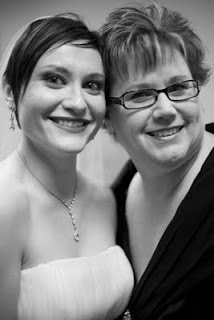 I was trying to remember exactly what I was thinking and feeling a year ago today, but it was all so fast and crazy (it was our wedding and my mother was violently ill fighting endometrial cancer) that I only remember bits and pieces. All I know is that we had the most beautiful autumn day bestowed upon us! It was bright and sunny, even a little warm (which was a surprise since it was Iowa in October! ); but the whole day was absolutely perfect to us! To my darling husband (Mr. C), I look forward to years and years of happiness shared with you! I cannot believe we've journeyed through one year already; time with you is so wonderful, time seems to fly! There will never be enough time with you! My heart is complete, because of your heart! Me loves you so, so much forever and always! 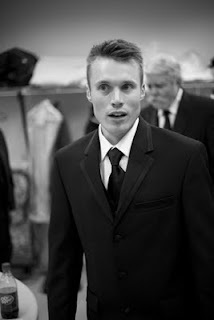 I'm going to leave you all with some of my favorite pictures from our wedding! Mommy and me! She was such a trooper even though she felt so poorly that day (we found out she had endometrial cancer the very next week)! 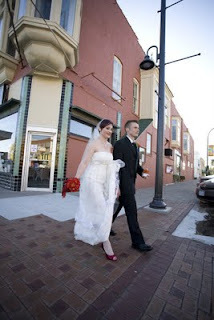 Walking to our ceremony! You can really see my red shoes here! 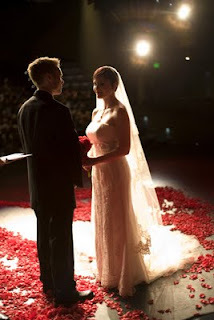 On the theatre stage saying the last of our vows...almost man and wife! 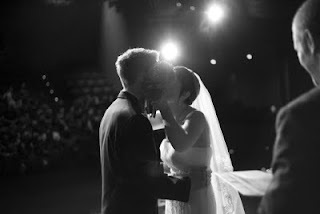 First kiss as Mr. and Mrs. C!!! Dancing the night and our lives away! My dream come true!